In The Seattle Times, Lornet Turnbull reports on the conflicting views within Washington’s black community over the issue of gay-marriage, which is currently on the ballot as Referendum 74. Turnbull notes that compared to Maryland, where gay-marriage is also being put up to a vote, Washington has a small black population. This could be described as an understatement. Maryland’s population is close to 30 percent black. Washington’s? About 3.6 percent. Only in King and Pierce counties does the black population even exceed 5 percent. But there is one place in Washington state that stands out in terms of its black demographics: Bryn Mawr-Skyway in King County, just south of Seattle. 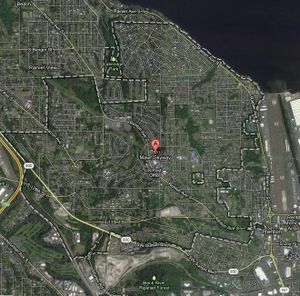 Bryn Mawr-Skyway is unique in that it is the only plurality black city, town or place in the Pacific Northwest. A plurality black place is one where African Americans make up the largest racial group, and Bryn Mawr-Skyway is the only such place on the West Coast outside of California. And not only does Bryn Mawr-Skyway rank third in the state for the percentage of gay couple households; among all cities, towns, and places in the United States, it ranks 97th. So in light of Turnbull’s article on Washington’s black community and Ref. 74, I wanted to take the opportunity to highlight Bryn Mawr-Skyway. It’s not a place you hear much about, but, in terms of its demographics, it’s surprisingly interesting.